Make the dough: put the flour, sugar and salt in the bowl of a food processor and place it in the freezer for 10 minutes or until very, very cold. Place the bowl onto the food processor and blitz to combine the ingredients. Add the butter and pulse until the mixture is coarse and crumbly. Stir in the water and lemon juice together and add to the dough while pulsing – pulse until the pastry is shaggy but holds together when squeezed in the palm of your hand; add more water if necessary. Dump the pastry onto a lightly floured surface and form it into a disk, without handing the dough too much. Wrap in plastic and refrigerate for at least 1 hour (well wrapped, the dough can be kept in the refrigerator for up to 3 days, or frozen for up to 3 months). Make the filling: in a large bowl, rub together the sugar and vanilla bean seeds. Rub in the cornstarch and salt. Set aside 2 tablespoons of this mixture then add the plums to the bowl, tossing to cover the fruit completely with the mixture. Roll out the dough into a 32-35cm (13-14in) circle then transfer to the prepared sheet. Sprinkle the reserved sugar mixture over the center of the dough, leaving a 5cm (2in) border around the edge. The plums will release some juice while in the sugar mixture, therefore lift each slice of plum from the bowl and arrange the slices on the dough in a spiral over the sugar mixture sprinkled on the dough. Drizzle with 1 tablespoon of the juices – more than that will make your dough soggy. Fold the outer edge of the dough over the fruit, pleating the dough as necessary. Place the galette in the refrigerator for 20 minutes – in the meantime, preheat the oven to 200°C/400°F. Bake the galette for 30 minutes, then turn the oven down to 180°C/350°F and bake for an additional 20-25 minutes or until the crust is golden and the fruit is bubbling – if the crust begins to get too dark towards the end of the cooking time cover the galette loosely with foil. Cool the galette for 30 minutes before serving. Covered with a tea towel the galette will keep at room temperature for up to 2 days. Looks so appetizing!! I will have to wait to get some plums over here, but I just copied your lovely recipe! !thanks a lot for sharing! 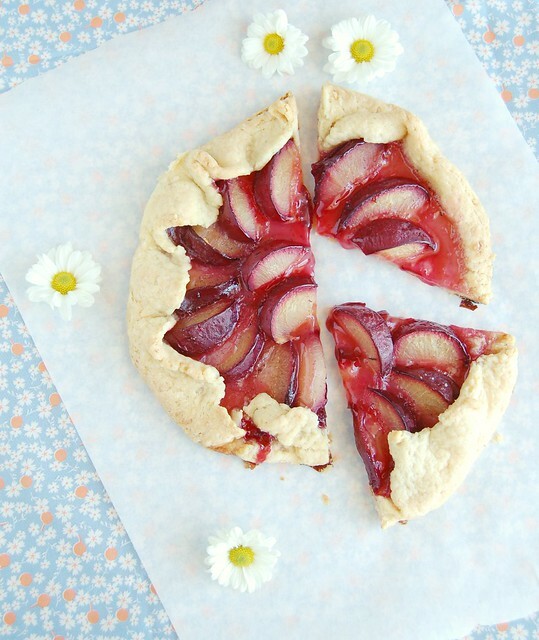 I love a good galette - this makes me yearn for plum season! Gorgeous! And what yummy flavors. Isn't this lovely! This makes me long for spring! Yum! Desserts with fruit always make my mouth water.